Why did Tom and Harry have to jigger with the mechanics of the holodeck and program specifically in the tavern? In TNG, the method for accessing holodeck controls and program code while the program was still running seemed pretty simple -- they called up the arch. The arch generally popped up in a convenient location where appropriate (like a back alley) and was undetectable by the holograms in the program (with the exception of Moriarty, because of how his programming had been retooled). It made sense that they were never restricted by location in the program if they needed to fix something without shutting everything down. In "Spirit Folk", however, they had go to one specific hub in the bar to reset the program, which forced them to work in a single spot where they could be tracked down and cornered (as they were). Was this a deliberate programming choice? I can't remember them ever stating that they couldn't use the arch or reset the program from the outside, so this must have been the case. I get that they may not have anticipated the holograms becoming self-aware and turning on them, but it still is inconvenient if not dangerous. If you were going to write a location-dependent hub into a holoprogram, wouldn't you write them to exist in several areas? Doylist answer: the writer didn't care about previously established Trek lore about the Holodeck, and made a one-time reason for things to go that way in service of the episode. Watsonian answer: Running a program(Fair Haven in both of Voyager's holodecks, because screw you if you want to play something different than 19th century fantasy theme park Ireland) constantly on a ship that hasn't seen a refit or proper station resupply and repair in over 5 years leads to a lot of rerouting, compromises, and systems working less than ideally. Which is in addition to getting certain features of non-critical systems that were both heavily modified by the Hirogen and blown up by the conflict with the Hirogen, works on a lesser level than if it was the standard Starfleet Holodeck. 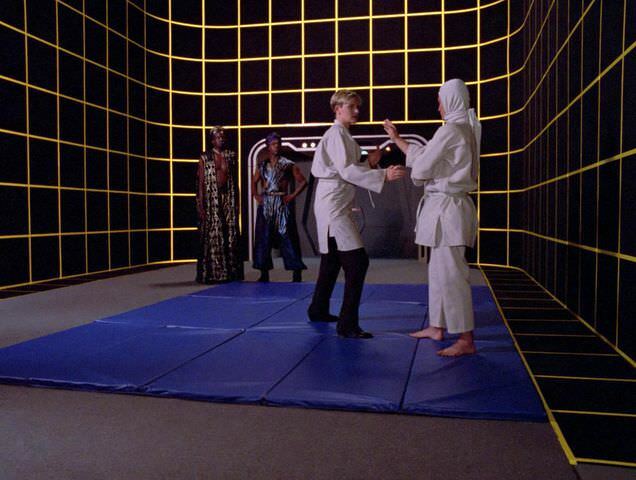 Remember, in 'Night', the Doctor and Tom Paris fighting with the controls brought down a Holodeck for a few days. I wouldn't be surprised if Quark's holosuites, which were maintained with a spatula, was in better shape by the end of Voyager's journey. There is also the possibility that Voyager's holodecks were a different/newer version than those seen on the Ent-D (this is almost certainly the case, not only do they appear very different but Voyager was built and sent on her mission several years after the holodeck first appeared - when it was implied to be "new" technology as well, meaning the Ent-D version may have been a prototype/early production run version). To expand on thata little, as best I can recall the only time we see the arch being called for/used was in TNG aboard the Ent-D. The Voyager version didn't have an arch that I can recall, everything was done by voice commands. 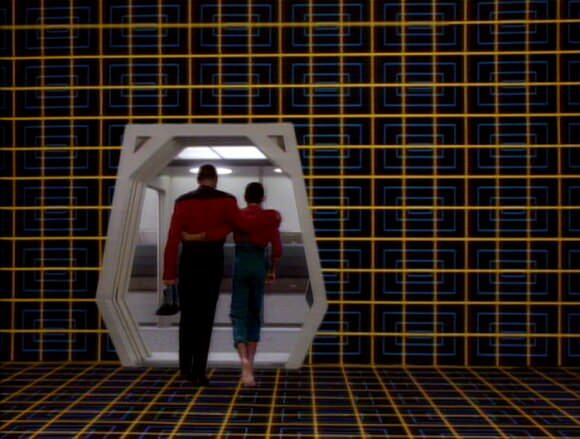 Maybe the TNG Holodeck-Arch is their version of a developer console? Essentially calling for the Arch is like going SUDO in Linux, and elevates your user privileges beyond certain safety measures. Smaller ship, so perhaps it was removed to save space. The holodecks on the Ent-D and Voyager look to be roughly the same size. This version seems to be without a Arch. And it has a smaller door. Possibly the Arch is still there... the two consoles on the left and on the right of the door in the Voyager holodeck might be a slimlined version of the bigger Arch used on the older models. It would be a better use of the space, I guess. 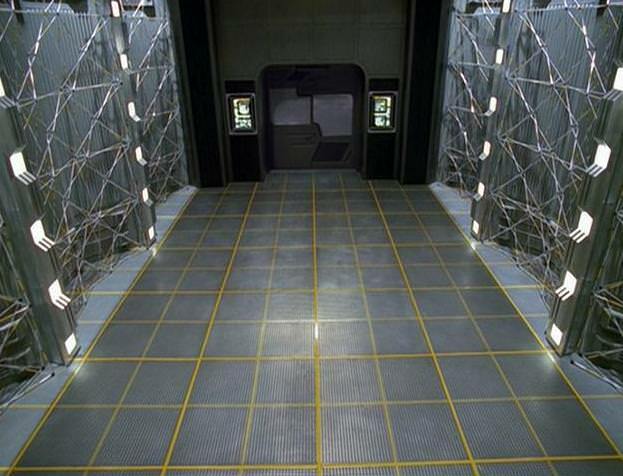 And the hidden access panels they had to use on Voyager might be a hardwired safety measure in case the other interfaces fail or are compromised. Possibly a reaction to the DS9 model having no hardwired panels outside the simulation accessable from inside. Or the Arch is part of the installed holo-emitters. In the version used on the ENT-D the emitters are like CRTs and later in DS9 they go to flatscreen-like models. And in VOY they have this antenna-grid style, possibly to simplify maintenance or improve performance. Yeah, I was really referring to any kind of internal paneling/console that existed -- presumably also where you would work with or repair the wiring or bio-neural gel packs. They also had the control panels outside in the corridor (like on the Galaxy-class) to work with -- again, not sure why they couldn't have reset the program with that absent a deliberate design in the program, but in the interest of not watching a bad VOY episode again I'll just accept that they couldn't. I'm fine with having it as a back-up system, so long as it's not the ONLY way to reset or otherwise fiddle with the program. But the mechanics of it as portrayed seem really stupid. If you wanted an internal fail-safe access point, wouldn't you make it so that you could call it up at any location? If you're in the bar it's behind the counter, if you're in the middle of the woods it's inside a tree trunk, etc. The God-Dammit-There's-Nothing-Gay-About-This Duo should have been able to enter the program in the middle of nowhere and make their fix, thus avoiding the mob. As shown, it's like, in a video game, having to go back to the town you started off in every time you wanted to access the options menu. There's also the issue that, if the perceptual routines are screwed up in the way that it happened here, the characters could find such a fixed station and rewrite the program entirely. God help the crew if they're running something more technologically-advanced than a 19th century Irish village. Side question, now that I'm thinking about adjusting the programming. I'd wager that part of that programming could entail determining which objects are purely holographic and which are actual replicated matter. Unless the hologram is able to read people's minds and know that they, say, want to pick an apple off of one of the trees and eat it, I assume that they have protocols in place that can account for these kinds of decisions and preferences. If things go pear-shaped and the holograms become self-aware, they could probably convert weaponry and bombs to actual matter, meaning that they pose a danger to anyone outside the holodeck, since you could chuck it into the hallway and it wouldn't dissipate. Might a hologram also be able to convert his own person into actual matter and walk out of the holodeck? The book that Picard threw through the door, and the two gangsters who tried to walk out, were destroyed within seconds. To have a successful creation of something, I think it would have to tie in with the replicator and transporter, as they attempted to do with Moriarty's girlfriend. tezunegari wrote: Possibly a reaction to the DS9 model having no hardwired panels outside the simulation accessable from inside. That was a Cardie model, though. Not the one shown in Emissary where Jake was fishing. (and the picture used above). That one was on the starfleet ship that transfered Sisko to DS9. I really should have stated that. Sorry. Pretty sure that was actually the E-D herself. It was the Love Boat-D. But then, in "Angel One", we see that a snowball will last outside of the holodeck, as did the virus that Wes and his friend caught and then spread to the rest of the crew (unless they were supposed to have gotten that elsewhere). If we aren't to discount that entirely, some things can be brought out of the holodeck, presumably because they are replicated matter as opposed to holograms. Pretty sure it wasn't. Picard and Sisko meet for the first time during Emissary. They'd have met before then if the E-D was the one transporting him to DS9. Well, we do know that the Holodeck has safeguards, so non-dangerous items carried by a person are replicated and leave the Holodeck, such as the sheet of paper Data carried in 'Elementary, dear Data'. So if a person is carrying it, the computer might replicate it, and then the item is recycled once the item is either thrown away, or taken out of the Holodeck. Same way that food and plates are recycled in a replicator when the meal is done(As long as you're tidy enough to put them away). The snowball is an outlier, and this was in the early days of the Holodeck. Unless Sisko was actively trying to avoid Picard for the entire trip, which wouldn't be surprising given how much he disliked him at the time. Just had another look at "Emissary" and the E-D is the only ship we see docked at DS9. We see her docked at a pylon while the captain's log plays, then we see Sisko and Jake disembark. Though the log does say that O'Brien and the first batch arrived on the E-D two days prior, so I dunno. If the E-D is there to support them and get them set up, seems weird to then have another ship show up just to carry Sisko and then completely disappear. In regards to O'brien being there 2 days prior to Sisko, but no other ships being seen. It's entirely possible that O'brien's teams were the first ones over, because of how bad off the station was. The Cardassians wrecked the station before they left, and there was having looting going on. It could be O'brien lead over an engineering team to get life support stabilized, alone with a small security team, until they got life support stable enough for more people. Possibly with the Enterprise docked to provide power/an operations point, while other, less powerful ships bring in material and new crew from within Federation territory. So, the Enterprise is docked in damage control mode, effectively acting as the space station, until O'brien and his team got things back up and running. I just had watch of the second scene of Emissary. Jake talks to Sisko and then someoe comms Sisko to tell him they are approaching Bajor, it is not Patrick Stewart's voice and Sisko refers to him as Captain. That holodeck ain't on the Enterprise.